The Spencer Woods Trackage: The photos below will show the track and benchwork construction of the Spencer Lumber Company's run up into the woods to their reload point at Camp 6, east of Whitcomb. We start with the highest trackage along the wall. At the far right is the reload point, and the track begins the descent downhill at the left side of the photos. There will be a double switchback employed to eventually get the track down to the mean benchwork level. The initial section along the wall looks quite simple, but it was the most difficult benchwork I've installed to date. The problem was one of access, both for attaching the risers to the joists (less than three inches of working room, and at some risers, even less), and attaching the sub-roadbed to the cleats (not enough room to fit a drill motor to drill the pilot holes). Generally, I clamped things where they had to be, then removed the assembly so that I could permanently attach parts together with screws. I did this in four sections until I finally got it all screwed together. After the switches are laid, I'll have to remove the sub-roadbed once again in order to install the Tortoise turnout motors and do the electrical wiring. Again, the problem is lack of clearance to fit the drill motor to drill the pilot holes for the Tortoise mounting screws, and the (perceived) difficulty in getting everything aligned properly. While this will be tedious, it will hopefully result in a much better installation of components. Once the high line is completed, I'll put in the double switchback and the mainline run heading west back to the mill. August 2015 Update: After sitting dormant for almost a year, work has resumed on the high line up to Camp 6. The track along the wall was installed in late July, and wired up. 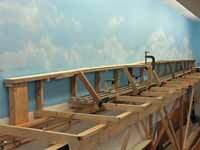 Then work started on the double switchback and the mainline back to the mill. The sub-roadbed has reached into Whitcomb and track will follow over the next few weeks. 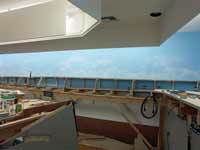 Some photos have been added below showing the progress. June 2016 Update: Yet another period of inactivity on the Spencer. However, I recently turned my attention to the remaining areas of construction (primarily the trackage on the peninsula across from the woods trackage along the wall) and got it done. The mainline enters the peninsula, then snakes all the way to the other end where the sawmill complex is located. The yard trackage is laid, the Tortoise switch motors are installed, and the wiring is connected. The trackwork for the entire Spencer operation is complete! 9/27/14: Stretched along the wall is Spencer's line up into the woods. A double switchback will be needed to get to this elevation. 9/27/14: The view of the high line from the other end. The switchback will connect to this level at the branch located by the clamp. 8/17/15: Work has resumed on the Spencer high line. Here's an overall view from across the layout room. 8/17/15: This shows the progress made over the past month, and is the first work here since last September. Track is down on the high line. 8/17/15: And here's the view from the other end. That's Maynard to the far right. 8/17/15: A view similar to above, but standing on a stool to give a better view of the trackplan. 8/17/15: Zooming in a bit, the grades are more apparent in the double switchback. 8/17/15: And back down to normal eye level. The locos will have a struggle on those grades. 9/7/15: The mainline is heading back to the mill in Oneida, and is passing through Whitcomb here. 9/7/15: And the view from the other end. The line will traverse a hairpin curve a bit west of here. 11/25/15: A long shot looking west, with the double switchback at the right, and the LCRR main- line at left by the aisle. 11/25/15: Zooming in a bit, that's Whitcomb in the center, and the Spencer switchback trackage at the right. 11/25/15: The LCRR will cross over the Spencer with a plate girder bridge spanning across that opening. The Spencer roadbed is that running beneath. 11/25/15: Here's a view from the other end showing the Spencer roadbed snaking around from behind, then crossing below the Louisiana Central track. 11/25/15: This view shot from atop a stool shows the track routes a bit clearer. The two tracks join at left for a short distance for shared trackage across a bridge. 6/30/16: Here's an overview of the Spencer sawmill complex. The yard is on the right, the loading track on the left. At center will be the sawmill and pond. 6/30/16: The same scene as the previous shot, but from atop a stool. The depressed area at center is the (future) mill pond. 6/30/16: And the view from the other end. The sawmill complex will be in the open area, the yard is to the left. 6/30/16: And the view from the stool. There will be a log dump at left. A bit of the loading track is seen at the lower right. 6/30/16: This final view is from the center aisle. This is the side from where the yard will be worked.